Good morning from Newport Beach at Esquire Photography HQ in Orange County everyone! It’s May 23rd and this is one Newport Beach Wedding Photographer who is still nursing a slightly sun burned pair of arms, shoulders & face from the Renaissance Pleasure Faire this weekend and I have a totally awesome May Madness Promotion for you! Or if you saw a recent May Madness Promotion for Mother’s Day for new Brides & Grooms getting married – I am offering a FREE 1 HOUR Signature Portrait Photography Session for the Mother of the Bride or Groom. Definitely an awesome value for moms of new couples who want to look like they just came off the cover of a Fashion Magazine. If you’re wondering what May Madness is, it’s quite simple. Each day for the ENTIRE month of May, I’m announcing a different promotion that will be for couples and/or photographers. If you’re looking to save some money on your wedding, portraits or even a workshop – then you’ll definitely want to keep in touch with me each day through the month of May! With that said, if you know what you want, already my photography & want to have a great time being photographed…. then definitely call this Newport Beach Wedding Photographer (Previously a Huntington Beach Wedding Photographer) who loves music & fashion, photography and art anytime. I hope you’re having a great West Coast Wednesday and stay tuned for many other amazing events that I’m sharing. From San Diego to Newport Beach, Ventura and all the way out to Paris, France and Berlin, Germany – I’ll have some fantastic Weddings and events that I’ve had the honour of photographing. UBER PS EXTREME!!! If you thought the first few days of “MAY MADNESS” have been pretty cool, then you definitely want to keep up with me every day in May. There’s a GRAND FINALE coming up at the end of the month & trust me, You’ll LOVE IT! 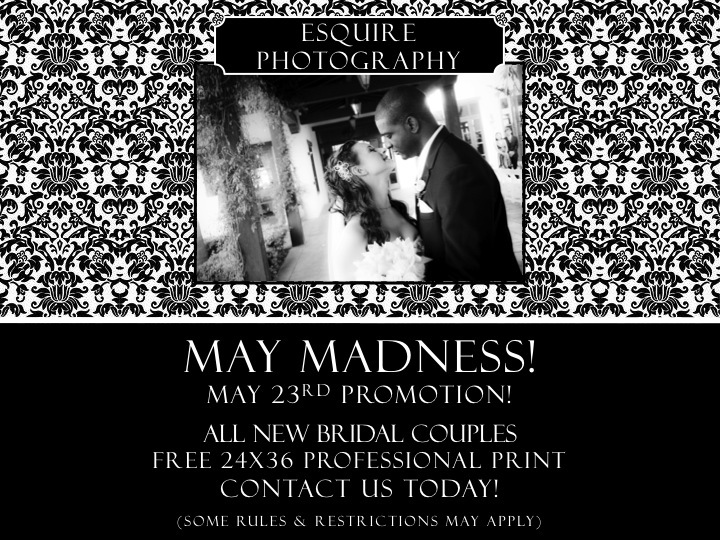 to show some love for May Madness for brides, grooms, and photographers all around the world!